Wait for the lawsuit for “intimidation” and “emotional distress”. Only problem is that the sign isn’t in Spanish. That is the best warning sign/label I have ever seen. Dismally too true. DensityDuck is the lawyer I want. This product has been conceived, designed, lofted, manufactured, distributed, and sold exclusively for the use of human being of sufficient intelligence to use it without injury to themselves or others. i see sharp edges on that sign which may make someone culpable!! This sign is merely that, a sign. For it to be a valid warning sign it must be designated so with the word WARNING, which it is clearly not. I’m sure there are additional requirements which vary by state, especially in California. The size of the sign, font & size, the placement height, citation of applicable code, nighttime illumination, ADA compliant seating, etc., etc. ad nauseum. For all of the foregoing reasons, I like it. I would enter freely but take the sign with me. 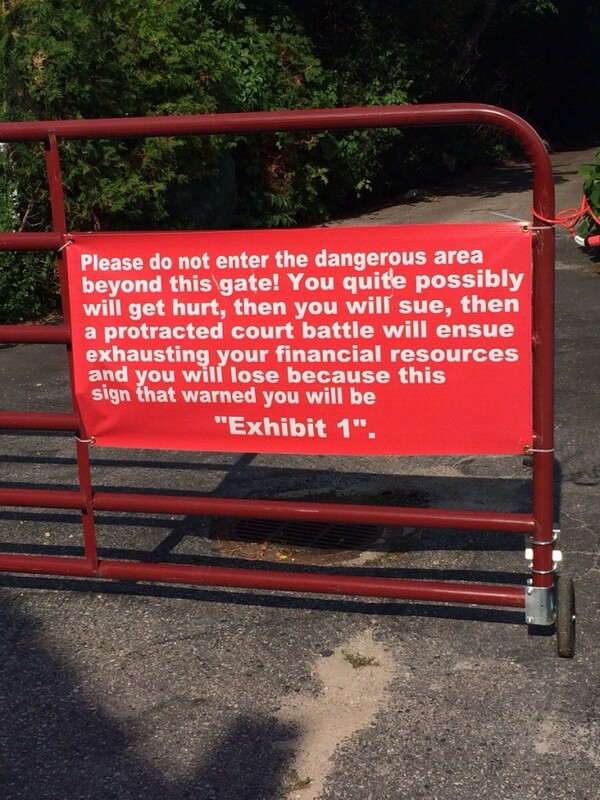 So much for “Exhibit 1”. Seen on a fence in Nevada, between “No Trespassing” signs.